Reward and communicate with your customers in the right way through the right channel using Azpiral’s white label loyalty app. Azpiral’s Loyalty app software allows B2C and B2B companies customise their loyalty app to deliver their unique loyalty program. Loyalty functionality available on the app includes Rewards, Points, Digital loyalty cards, Competitions, Offers, Spend card, Donation to Charity software and in-App Messaging. Companies can choose the functionality they wish to make available on their loyalty app and fully rebrand the app to display their companies unique branding. It’s already developed – quick delivery and lower cost. 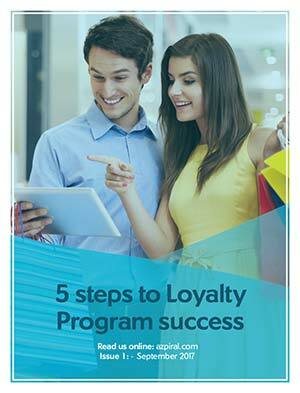 Turn on and off functionality – evolve your loyalty app as your loyalty program grows. Design document outlined – graphic designers will find it easy to design. White Label App but multiple design options available for each element – Can totally transform look and feel to suit your brand. Increase customer engagement through personalised in-App messaging. Trump your competitors by giving your customers the option of a digital loyalty card on their smartphone.